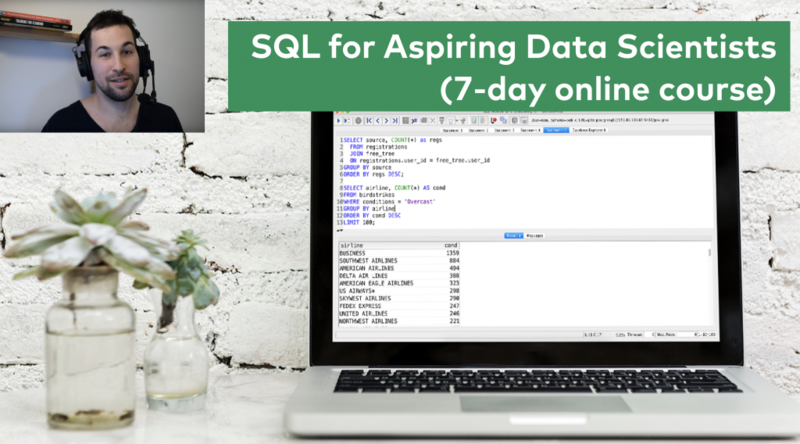 This is the second episode of my SQL for Data Analysis (for beginners) series, and today I’ll show you every tiny little detail of the SQL WHERE clause. It’s not by accident that I’ve dedicated a whole article to this topic; the SQL WHERE clause is essential if you want to select the right bit of your data from your data table! In the first half of this article I’ll show you the different operators. In the second half, we will finally import our favorite 7.000.000+ rows dataset (the one with the airplane delays) and eventually I’ll give you a few assignments to test your SQL knowledge and practice a bit! Check-check-check? Okay, you are ready to learn new things! Note: to get the most out of this article, you should not just read it, but actually do the coding part with me! So if you are on the phone, I suggest you save this article and continue on a computer! comparison operator What does it mean? 1. How would you select all the animals, that are not zebras? 2. How would you select all the animals for whom the water_need is less than 300? Okay, I think you got it! So let’s take this to the next level! Let’s say, you want to select all the rows where the user_name starts with ‘frank‘. 1. How would you select all animals whose name contains at least one e character? 2. How would you select all animals whose name ends with ‘roo‘? % means any string of characters of any length. _ means any character you want, but only one. E.g. the word tiger can be found using wildcards like 't%'. But you can use 't____' too. 3. How would you select all animals whose species name is exactly five characters long? This is how the SQL WHERE clause works with the LIKE operator. You can combine conditions with logical operators! There are more, but here I’ll highlight the two most important: AND and OR. Let’s say we want to select all the animals whose name is exactly five characters long, except for tigers. We have two conditions and we can do that with SQL WHERE boosted with the AND logical operator. Yes: you can use multiple AND operators. Finally, let’s see an example of the OR operator! It returns all the animals that are lions, plus all the animals that have less than 300 water_need. AND returns every row where all the conditions are true. OR returns every row where at least one of the conditions is true. Imagine a situation where you want to select all the animals whose unique id is any of these: 1001, 1008, 1012, 1015, 1018. You have already learned a way to do that! Can you find it out? While it’s a valid solution, it’s certainly not the most elegant way to get the job done! If you want to reduce the number of ORs in your SQL WHERE clause, you should use the IN operator instead. But it’s a little bit shorter. How to select all the animals that are not 5 characters long? Are you bored with our 22-row zoo dataset? Me too! It’s time to go a bit bigger! Let’s import the 7.000.000+ row air-delays dataset we have used before! Follow these steps to have it imported into your SQL database! Note: we will work in bash. If you haven’t done my bash tutorial series yet, I highly recommend doing at least the first episode, but if you don’t want to, it’s also okay to simply follow my lead step by step below. Open Terminal and login (ssh) to your data server! Download the “flight delays” data! Note: If you have this already, skip forward to 5. Set up dtrx! That’s a command line tool for unzipping stuff! Note: It will take around ~60 seconds to process the whole file, so don’t worry, your Terminal is not freezing, it just needs some time. Now we have to give permission to our postgreSQL user to create tables and load data into them. This will need multiple steps. Here’s a gif first (note: my username is “dataguy” – yours might be something else). alter user [your_user_name] superuser;This turns your original user into a super user! Go back to your user! psql -d postgresOkay, this was the hard part. And finally, copy the data from the csv file you have just downloaded! How many flights did the plane with the tail-number ‘N253WN’ take on 23rd April, 2007? The only trick is that the day, the month and the year are in different columns, so you have to use multiple AND operators to filter simultaneously for all the conditions. And that would have returned wrong results! Knowing, understanding and using SQL WHERE clauses with the right operators is crucial! In this article you have learned the most important parts of it! Now – having a good base knowledge – it’s time to continue with the next important SQL topic! In my next article I’ll introduce the basic SQL functions (MAX, MIN, SUM, COUNT) and I’ll show you some more important clauses (ORDER BY, GROUP BY, DISTINCT). You can continue by clicking here. It is probably a wasteful use of parenthesis, but I intuitively went for it, having worked with Boolean before, so was wondering if it's something that would work. I haven't been able to do the coding myself as I'm having some issues with the laptop, but hoping to get on it soon. Even if it sounds logical, unfortunately it doesn’t work in PostgreSQL. I’m getting an error: 2007.csv: No such file or directory. I think you missed a column when you create your SQL table! “COPY flight_delays FROM ‘/home/tomi/practice/sql_ready.csv’ DELIMITER ‘,’ CSV HEADER;” which is copied from the article should have “practice” removed like it is in the video. That was the issue I faced and hopefully it might help others. Thanks a lot for the comment Sean! No idea why it happens. I believe I followed all the steps properly. Lol I find the answer, my bad, I had made a mistake when formating the data into sql.csv in this command ” cat 2007.csv |cut -d’,’ -f1,2,3,4,5,7,10,11,14,15,16,17,18,19 | grep -v ‘,NA’ > sql_ready.csv ” sorry about that.